SUMMER 2013 BEACH VOLLEYBALL REGISTRATION IS NOW OPEN!!! Manhattan Location - Pier 25! 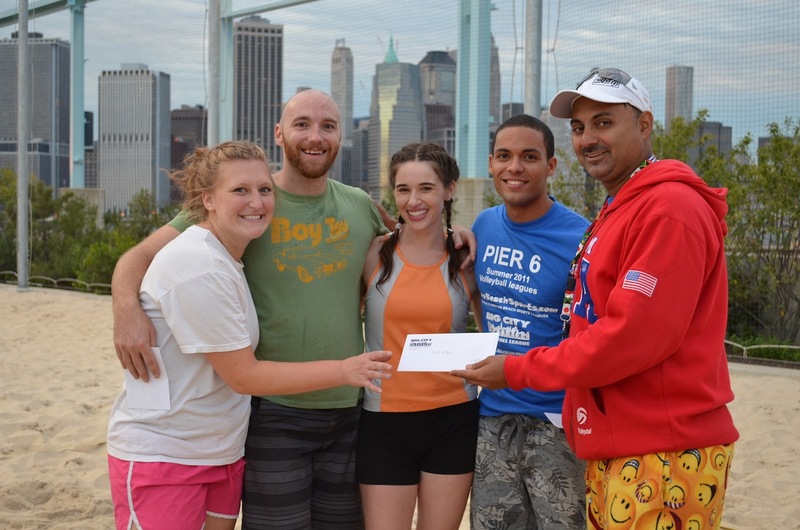 Metro Beach Sports and Big City Volleyball are excited to announce that registration for our Summer 6v6 Co-Ed Beach Volleyball League in MANHATTAN AT PIER 25 is Now Open! 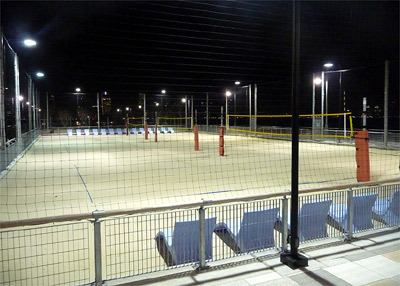 With Three enormous courts, professional net systems that have in-ground poles, spectacular lighting and conveniently located in the heart of Tribeca, we can't wait to start the summer season. Games will start between 6pm and 10pm Tuesday evenings. SEASON BEGINS MAY 7th with refereed ranking scrimmages followed by an 8 match season and playoffs. The entrance fee is set at $1500 and includes T-Shirts. Space is extremely limited so sign up today. We fielded over 100 teams last summer and only have spots for 30 teams this year. We are sure to Sell Out again!!! Register your team online (includes a $250 deposit for non-corporate teams). To register a team, click here.. TEAM REGISTRATION DEADLINE IS MAY 7th. 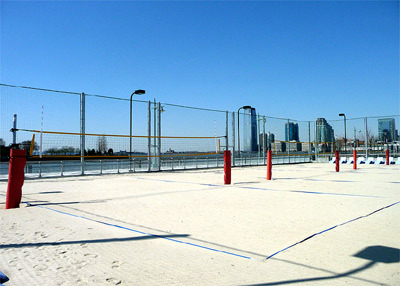 Pier 25_04 Unfortunately, due to limited space we will not be placing individuals on teams this season. If you would like to participate as an individual, please fill out a free agent form clicking the box for the beach and if there are any teams looking for players, we will pass along your information. To fill out a free agent form please click here. We play in all weather situations except thunder and lightning. If it looks like rain bring a change of clothes. There are toilets at Pier 25, but no changing rooms. We will be giving teams t-shirts which you must wear. No other uniforms are acceptable. Other rules and regulations will be distributed to the teams once they have registered. Co-ed rules require at least one woman on the court at all times, but never more than four men. And lastly, please be aware that all players must be at least 21 years of age for insurance purposes. STAY TUNED FOR MORE INFORMARTION ABOUT THE 2013 SEASON! 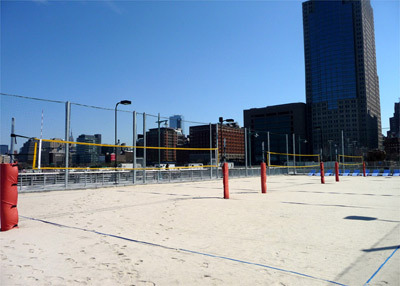 On Wednesday and Thurssday evenings we're organizing our Summer 6v6 and 4v4 Co-Ed Beach Volleyball Leagues on BROOKLYN BRIDGE PARK'S PIER 6 new beach volleyball courts, located at the end of Atlantic Avenue in Brooklyn Bridge Park. 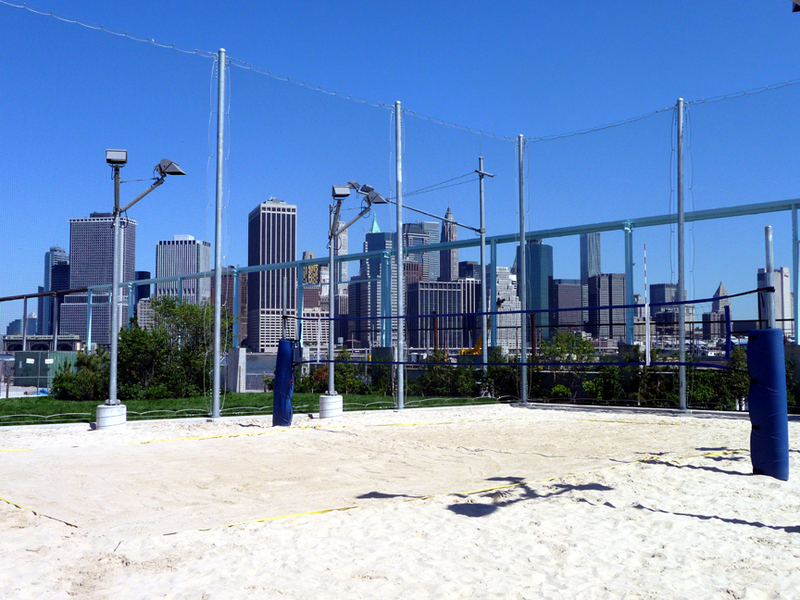 With three brand new courts, professional net systems with in-ground poles with spectacular lighting and stupendous views of New York Harbor, downtown Manhattan and the Brooklyn Bridge, our first summer session in this exciting new venue will begin shortly. Games will start between 6pm and 10pm on Wednesday and Thursday evenings. SEASON BEGINS shortly with refereed ranking scrimmages for new teams followed by an 8 match season and playoffs. The entrance fee is set at $800 (4v4) & $135 (individuals) and includes T-Shirts. Space is extremely limited so sign up today. Our first summer session sold out and we are sure to Sell Out again!!! Matches will take place Wednesday and Thursday day evenings making it very easy on your schedule! Start times vary week to week, but typically are 6pm, 7pm, 8pm, 9pm & 10pm. Each night of play consists of three 21-point games against an opponent using rally scoring. You will be placed in one of three different co-ed skill levels, guaranteeing you exciting matches each week! There are toilets at Pier 6, but no changing rooms. We will be giving teams t-shirts which you must wear. No other uniforms are acceptable. Other rules and regulations will be distributed to the teams once they have registered.